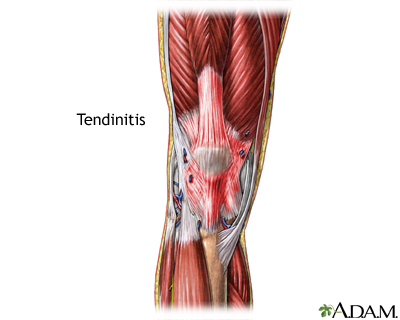 Tendinitis is inflammation, irritation, and swelling of a tendon, which is the fibrous structure that joins muscle to bone. Tendinitis pain in the knee is located in the front of the knee. The pain gets worse when going up and down stairs or inclines. Tendinitis knee pain can happen in runners, skiers, and cyclists.